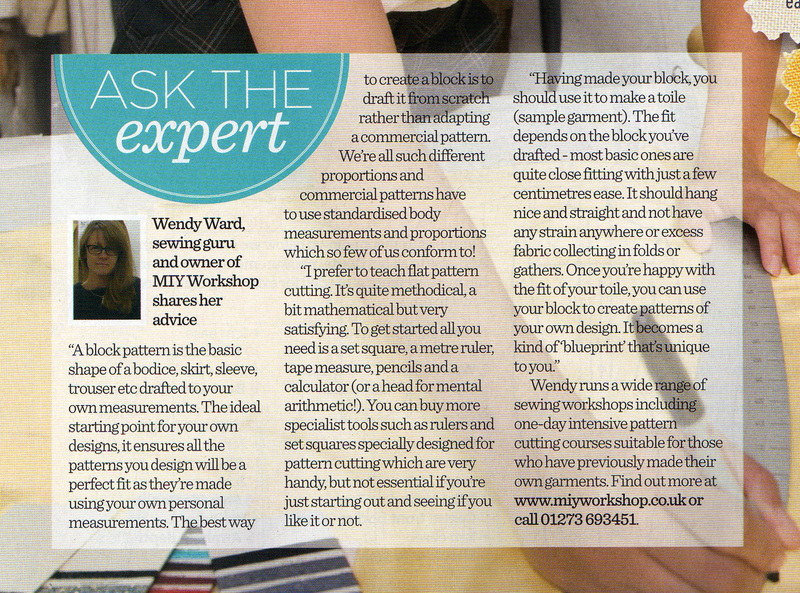 Here I am; the expert and “sewing guru” on page 29 of the August issue of Sew magazine which is on sale now. The feature is all about pattern cutting – what blocks are used for and why it’s important to make toiles and includes instructions for drafting basic bodice and skirt blocks. If you fancy having a go at designing your own patterns and drafting the perfectly fitting garment, there is just one space left on my City & Guilds Pattern Cutting Summer School (more details here) and I have a few pattern cutting one-day workshops coming up in the autumn (more details here). This entry was posted in Full Day Classes, MIY Workshop, Pattern cutting and tagged brighton, city & guilds, MIY Workshop, pattern cutting classes, pattern cutting classes brighton, pattern cutting courses brighton, sew magazine, Wendy Ward. Bookmark the permalink. Already got the mag – brilliant article – well done! Glad you enjoyed it, thanks Lynn!